I absolutely love my engagement ring and can't imagine any other ring on my finger. Not only is it beautiful, and mine, but its a personal buy that my fiancee Gareth brought me, something he took his time on and something he decided to buy to put on my finger forever. Gareth told me he went to four different places to find my ring, and it took him over 5 hours to search in total before he made the buy! I'm not sure what other rings he did pick up and I don't think I'd like to know because I can't imagine another ring taking its place. It doesn't however stop me looking at other engagement rings though does it? It doesn't mean I want them on my finger, but it is interesting to see the differences between mine and Gareth's likes, and although there are personal differences in our preferences, we both love the ring he picked to be our engagement ring. 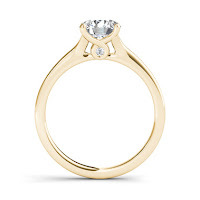 Luckily me and Gareth didn't go shopping for our engagement ring together because just showing him a few of the rings I like the style of has come up with us disagreeing, and the ones he loved, I loathed! Now I'm finding it extremely crazy how together, staring at my finger, we love our ring, but the two below from Mode, we do and don't agree on! For example the ring above Gareth loves, I don't think its ugly, its extremely pretty but as my engagement ring, I don't think it would work! Gareth loves the patterns and all the detail, as do I, but I personally think it would work better as a wedding ring, rather than an engagement ring! 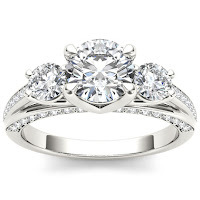 However this one above is the one I love, not that I'd ever replace my ring, but if I needed my ring to be cleaned or repaired, I could easily walk around with the above ring on my finger temporarily. It has, or at least looks like it has less detail then mine, but I love the side glance as the photos show! Now I'm wondering about wedding rings, who chooses them? Is that something we do together, or do I pick them, or does Gareth pick them? Or the maid of honour or the best man? I think I could deal with Gareth picking them as he made a great selection with the engagement, but I don't know if I could trust anyone else! Plus Gareth doesn't always pick the best items for himself, so although he buys me beautiful flowers and jewelry, it doesn't mean he'd pick a nice wedding ring for himself does it!? What if he gets us two different colours? Or two complete opposite styles? Oh my, the thought is too scary! I need to go and search the wedding tradition of buying the rings! The thought is scaring me too much, at this rate we'll be having jelly sweeties!